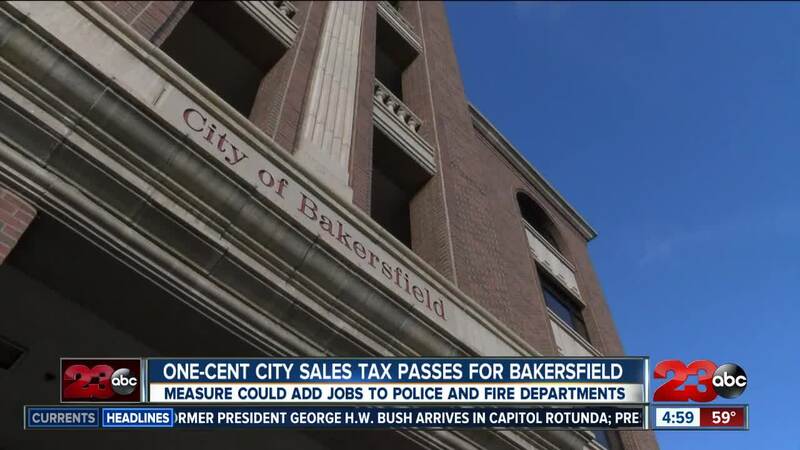 BAKERSFIELD, Calif. — The City of Bakersfield is expected to see an increase in tax revenue as voters approved the passage of Measure N, a one-cent sales tax within city limits. The Kern County Elections Office reporting their final batch of numbers Monday afternoon showing Measure N passing by a 97 vote margin. The elections office says as of Monday afternoon, all outstanding ballots have been counted. According to the ballot wording, the measure will provide the city with $50 million dollars annually to be used for public safety programs, attract jobs to Bakersfield and address homelessness. City Manager Alan Tandy said the tax will go into effect and money will begin to be collected April 1, 2019, which is the last quarter of the fiscal year. Tandy said their top priorities are adding 100 staff and personnel to the Bakersfield Police Department, which will take an estimated three years, restoring the cuts made to the Bakersfield City Fire Department in 2008 and creating a sounder and more stable city budget. Prior to Monday's updated vote totals, the Measure was failing by just 13 votes pushing the Bakersfield City Council to delay a vote to provide $200,000 in funding to the Bakersfield Homeless Center. The council pushed that vote to December 12 in hopes the fate of Measure N would be decided. 23ABC spoke to council members Willie Rivera and Andrae Gonzales last week and they said while the funding the homeless center is independent of the Measure N vote, it's passage would make that decision easier.